How Can Power Words Help You Land Your Dream Job? What are power words, you ask? Power words are buzzwords and special phrases that signal to a company that you’re on their wavelength. Use them to tailor your application to a specific company and show that you know their mission, their approach, and their values—and that you’ve done your homework. These are the words that they’re watching for to find out which applicants are best suited to join the team. A big, juicy job description is like a math textbook with the answers in the back. It lists the requirements, skills, and daily tasks of the job you’re applying for, so all you need to do is say that you meet those requirements, have those skills, and are up to that set of daily tasks. Piece of cake, right? Doesn’t matter if you’re a marketer, lawyer, teacher, or techie: every industry has its jargon. Get a handle on the specific words people in your line of business use to describe the work they do, because guess what: those are power words. In your resume and cover letter, include jargon that shows that you not only know how the industry works but also how it talks. Verbs will help you express yourself, convey your skills, and win at life. See how great verbs are? Most resumes are essentially souped-up lists of stuff you did. And it sounds a lot better to say you orchestrated, designed, spearheaded, or led instead of just did. 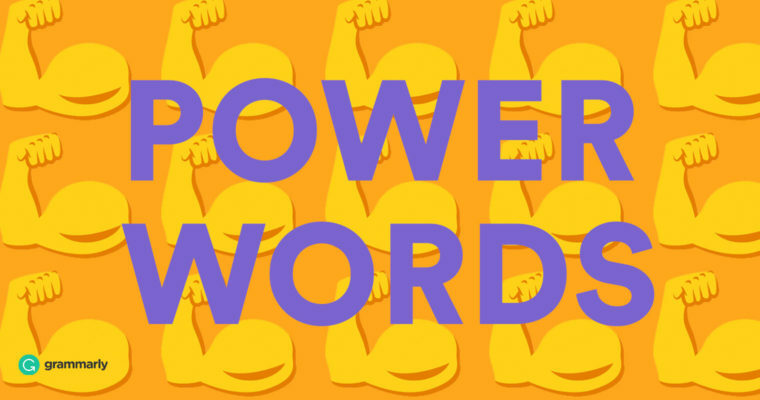 That’s right: most power words are power verbs. Now you know why power words can help you land a job, where to look for the right power words in the job and company descriptions, and how to show what you can do with the right set of vivacious verbs. But which verbs in particular, you might ask?